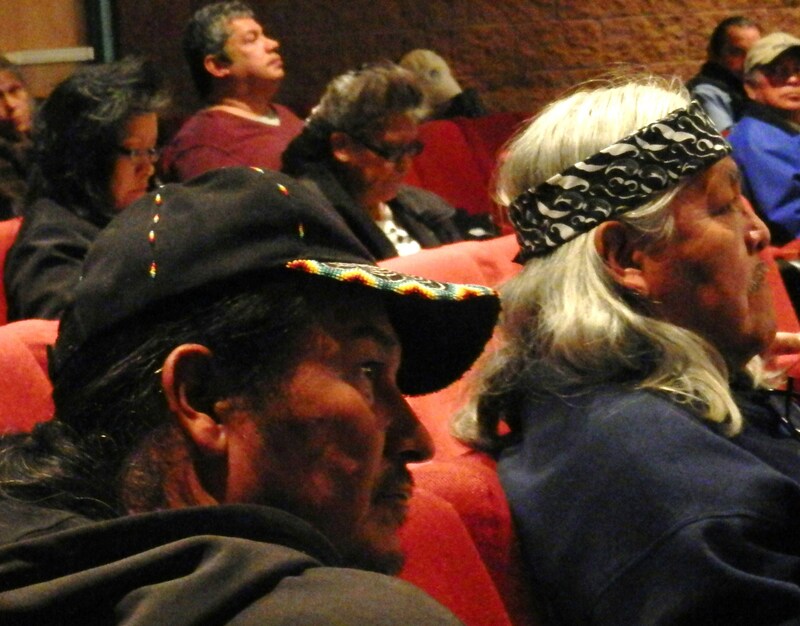 WINDOW ROCK – Navajo not alone when it comes to uranium mining impacts: If there is one thing the Dine people learned from this week's screening of films at the International Uranium Film Festival, it's that the Navajo Nation is not alone when it comes to suffering from the impacts of uranium mining and processing. Norbert G. Suchanek, general director of the festival, was at the Navajo Nation Museum in Window Rock this week along with Marcia Gomes de Oliveira, executive director, to present a series of Yellow Oscar-winning films – the trophy of the Uranium Film Festival – about nuclear practices all over the world. They travel next to Washington and New York for screenings in February. Suchanek, a journalist, author and filmmaker, was born in Wuerzburg, Germany, but now makes his home in Rio de Janeiro, Brazil, where Gomes also resides. Although Suchanek does not screen any of his films during the festivals, he did speak about one of his documentaries and what he has observed in other countries. He made the film, “Uranium Mining – Not in Nisa,” about a community in Portugal that said “no” to uranium mining. “They decided that, 'No, we want to continue a sustainable life' based on the production of cheese, olive oil and all that they created. They made this decision in 2010. It was really the first community that decided not to allow uranium mining before it started. Most of the communities decide against uranium mining after it's started. But they already knew experiences from other places in the world and they decided, 'No, stop! '” he said. Common denominator - On the Navajo Nation, whenever the Cold War legacy is discussed, there is always talk about the deaths of former uranium miners and related illnesses. When asked whether he has observed sickness associated with uranium mining in other parts of the world, Suchanek said, “It's always, always. But the uranium mining companies – it depends on the country – they have special techniques to cover up, to hide those ill people. “For example, I filmed in Namibia, and I was together with the Native peoples and with uranium mining workers, and they told me the practice of the uranium mining companies over there,” he said. Uranium was discovered in the Namib Desert in 1928, however, its first commercial uranium mine did not begin operating until 1976. The country in Southwest Africa has two significant uranium mines capable of providing 10 percent of world mining output, according to the World Nuclear Association. “When a worker of the uranium mine became ill, he lost the contract and they sent him home. The workers in Namibia are coming from all over the villages there. In Namibia, it's a big African country with diffrent African tribes. The workers became ill in the mines, but they die in their home. Then they say, 'Well, they became ill; cancer from there, not from the mine.' You cannot see the dying people inside of the mining area,” he said. Phase-out of nuclear - Germany once had the third largest uranium mine in the world, Suchanek said. The Wismut underground mine in East Germany produced uranium for all nuclear weapons from Russia. The Berlin Wall – a symbol of the Cold War – separated East and West Berlin. When the wall fell in 1989 and Germany was reunified, Suchanek said, “It was a clear decision of our government in Germany to close the mine in a second because it was clear that in a democratic state, you cannot have uranium mining.” The reason, he said, is because of the risks. “It harms so much the people, you cannot accept. You only can make a uranium mine in a state where the people are not informed, or suppressed, or economically depressed. Only in those states you can have a uranium mine. “We have this discussion in Germany that, 'OK, we do not allow uranium mining in our country, but we have 40 nuclear power plants and they need uranium fuel, so we buy it from Namibia. What kind of moral is that?' We cannot accept a nuclear power plant if we cannot accept uranium mining in our country, or I'm a racist,” he said. After the March 2011 Fukushima nuclear disaster, Germany took eight nuclear power plants off line. Another nine will be phased out by the end of 2022. Germany is now grappling with what to do with millions of cubic yards of radioactive waste that will result from the decommissioning. Big dreams - Suchanek and Gomes began soliciting films in 2010 with the dream of creating the International Uranium Film Festival. Within three months they had received approximately 80 films from all over the world, he said. The films were screened and the first festival was held in 2011 in Rio de Janeiro. “We still have no money. We are still poor. We hope that we get, one day, a big sponsor that supports the festival so that we can really pay the tickets for all those film directors to come and talk about their films. In Rio, the filmmakers came by their own costs. They paid plane tickets just to attend the festival because it became like a 'think tank' for uranium filmmakers,” Suchanek said. They brought the film festival to the United States in hopes of attracting sponsorship from solar energy companies, wind energy companies, or environmental friendly Hollywood stars. “There are many 'green' Hollywood stars,” he said. There are also about 400 million people worldwide against nuclear power, according to Suchanek. “If everyone gives us a penny, we can make uranium film festivals in every big city!” But for now, they are going on faith and waiting on their first dollar. Support the Uranium Film Festival!